Are you looking to monetize your traffic via affiliate marketing in a better way? Or are you looking for new opportunities and products which you ca promote easily and get high commission? If so, then you are just a click away to make sure you have reached the perfect Performance marketing network “ ClickSure ” that will fulfill all your dreams. 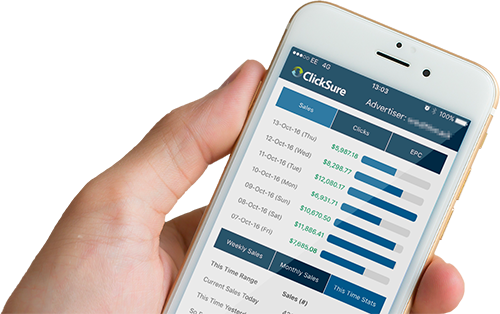 ClickSure is your dream home with performance marketing reinvented with parameters allowing you to earn higher commissions and drive more sales resulting into massive profit. Their powerful and intuitive tracking software allows you to keep a track of every clicks and conversions in a simple platform. If you want to promote your products and services then ClickSure ensures that your products & services are sold to the targeted audiences. If you are an affiliate then it is important to keep communicating with the advertisers, ClickSure ensures to encourage you in filling the communication gap with the advance tools and best in class support. Internet is playing a vital role for marketing products & services through various social media platforms and channels. Affiliate forum is a more effective place as it targets relative audiences and along with it offers commissions and tools that help you to drive marketing success. It gives brand exposure to your products & services and keep a track of your marketing campaigns. You can manage your campaigns using the tools and technology effectively and ensure you reach the right audiences to drive more sales. The vision of affiliate marketing is simple, make the world a better place for affiliates and advertisers to freely communicate and collaborate by encouraging internet marketing. With innovation built on the latest technology, results are surely different and uprising. ClickSure is one such affiliate network that provides simplicity and flexibility without compromising the innovation and technology. ClickSure is a SaaS technology company located in Mauritius which is a technological and business hub with infinite opportunities to grow business with innovation. It was established in 2011 with 460k affiliates, 29k advertisers, 1k+ vendors, 1.2 billion+ clicks tracked and 600k actions tracked. ClickSure is different from other traditional networks as it removes the barrier and allows the advertisers to directly contact the publishers , hence everything is crystal clear. You are allowed to contact any of the members of the ClickSure community that lays down the foundation of an unbreakable relationship and builds a strong trust within them. This results in increase in sales and revenues and goes on increasing day by day. For a solid and long lasting partnership it is essential to know with whom you are working with, ClickSure open messenger tool provides you the right path to freely communicate and display your offers to over 460000 affiliates. ClickSure envisions to provide innovation and cutting-edge technology by creating an online platform that not only motivates but also drives small businesses towards success. Advertisers can enjoy the easy platform with a simple setup and pay only when a sales is made. As an advertiser this platform enables you to promote your offers among millions of affiliates. Easy to use tools allow you to communicate effectively and build strong partnerships that lasts for a long time. Weekly commission payments ensure that your money is in good hands. It’s an easy and interactive platform for sellers and buyers. Sellers can showcase their products with good offers and let the buyers decide the taste of the products. You can showcase your products and attract new affiliates in the marketplace. Also, if you are planning to launch new products then you can notify Affiliates using the launch calendar. To simplify the process of managing multiple accounts and meeting the time-constraints, opening a Master account saves your time and eases out the process of managing multiple accounts. A central location helps you manage your affiliate commissions and advertiser invoices along with KYC and payment details, thereby saving your precious time. Many big brands trust and use ClickSure for its impeccable services. Some of the clients that consistently use ClickSure are: WilliamHill, Plarium, Ladbrokes, PlayTRex, etoro, ScanGuard and many more. These clients very well know the difference that ClickSure has made to their business with innovation, technology and collaboration and the results achieved are desirable and over-whelming. Communication is the backbone for any growing business and ClickSure knows its importance. Hence, it provides an open platform for advertisers and publishers to contact each other directly by eliminating the middle-man. This saves a lot of time and enables you to focus more on business strategies. You get complete authority to manage your campaigns as you want to. Whether you are an Affiliate, Vendor or an Advertiser, you are the decision maker to promote your business with your willingness. Most of the marketing networks restrict your access to cutting edge tools and resources or else charge you extra for accessing third party tools. At ClickSure, you get exclusive access to a set of tools that includes reporting, campaign management, geo-targeting and more. No more headache of KYC documentation or Affiliate commissions, just focus on growing your business and leave the rest on ClickSure. You just have to top up your ClickSure account and your affiliate commissions will be distributed within the time constraint. Don’t worry about fraudulent traffic and transactions as ClickSure uses powerful third party tools such as Forensic that detects and thwarts unknown traffic and sales thereby protecting your business. ClickSure is a well-known affiliate network with a global reach over 110 countries. This helps Affiliates, Vendors and Advertisers to enter into a marketplace full of new opportunities and partner with global brands to boost the sales and profit. There are no hidden fees so as a Vendor or Affiliate you can work directly with the Advertiser by choosing the best payment model. All the transactions are transparent so at every stage you know the exact cost associated with each task or action. Most of the affiliate networks include a middle-man and so starts the politics and headache. This results in loss in your business as your mind is diverted and instead of focusing on strategies to grow your business your time is consumed in debating with the middle-man. ClickSure eliminates the middle-man by providing an open network where you being an Affiliate or Vendor can communicate openly with Advertiser by using effective tools that help your build strong and long-lasting partnerships. At ClickSure you get variety of exclusive offers with different payment models to choose from. If at any instance you should face any problem then you can contact the support team available 24/7. If you want to earn more commissions then you can utilize the 2nd tier program and refer other Affiliates and pile up the commissions. It is quite boring using the same old tools, tracking platform and resources with other Affiliate networks but ClickSure has innovated new set of tools and resources to keep you ahead and make it more interesting for you. A brand set of inventory is awaiting for you! With an innovative calendar you can know about the upcoming new offers that are going to be live so you can plan to work on your campaigns and achieve outstanding results. You can upload your profile image and write a bio about yourself to showcase your talent and impress your clients. Write about your interests and work experience as well as promotional methods as an Affiliate to Advertisers. Get the insights to your traffic and analyze the data with the latest & advance technology that would boost your revenues. With open platform you can communicate directly with the advertiser and there would be complete transparency between you and the offer owner. Generate quality leads and traffic to secure higher payouts. With an intuitive dashboard you can overview the statistics, analytics and affiliate commissions with in-depth detail of the number of clicks & earnings per click, actions and conversions. Every advertiser looks for trustworthy Affiliate and ClickSure is the best platform to gain trust from the Advertiser by building up your trust score and with more trust you are more likely to secure higher private payouts when promoting a campaign. At ClickSure you get a wide range of offers in different verticals. Choose the vertical which best suits your business and also a payment model like CPA, CPL and mobile. Some of the popular and hand-picked verticals that you can choose at ClickSure includes: Dating, Surveys, Internet Marketing, E-commerce, Business, Web Hosting, Health, Mobile Apps, Trading, Beauty, Casino, Diet, Sweepstakes, Surveys and many more. No hidden fees, no contracts, complete transparency. Sign up for free and get access to a massive marketplace with global recognition. Choose any payment model and get paid weekly for high converting offers. Easy to use interface, provides a dashboard with analytics and reporting by use of the latest technology. Eliminate the middle-man and directly communicate with the Advertiser to gain more profit and build strong partnerships. Friendly support 24/7 with 2 dedicated account managers on Skype, amazing tools and resources to help you in campaigning and promoting. Although there are many big affiliate networks in the world but somewhere they create an obstacle by putting a middle-man in between your communication. ClickSure ensures that there should be complete transparency between the Advertiser and the Affiliate for effective communication. Starting a campaign with ClickSure is easy and free, just sign-up for free and become a member of huge community with global platform. ClickSure surely makes a difference to your marketing results with innovation, technology and collaboration. Click it & Get Assured.